With the recent water crisis in Metro Manila, the quest for alternative sources of water in the country’s most populated region emerges. At the water forum entitled “El Niño, water infrastructure planning, and the supposed water crisis: facts and figures” on Apr. 4 at the UP Diliman National Institute of Geological Sciences (NIGS), experts identified these possible sources. Dr. Patricia Ann Sanchez, chair of the UPLB Interdisciplinary Studies Center for Water (Water Center), named the Agos Watershed in Quezon, the Umiray Watershed in Aurora and Quezon, and the Laguna Lake Basin, as among them. Dr. Guillermo Tabios III, professor at the UP Diliman Institute of Civil Engineering, also identified Laguna Lake, alongside Sumag-Biliway River Basin, Laiban-Kaliwa Dam, Pampanga River Basin, and groundwater in Metro Manila. “If we consider the potential sources, kailangan din nating tingnan ang mga madi-displace na communities at indigenous peoples,” said Dr. Sanchez, in addition to taking into account the protected areas and biodiversity. Dr. Sanchez underscored the need to optimize available water resources through resourcefulness and technology even as there are potential water sources that have been identified. Ramon Alikpala, chief executive officer of Future Water Asia, cited how Singapore uses the Circular Water Management Scheme by treating and desalinating water from sea and storm and retreating waste water. “Whatever comes out of wastewater goes back and it’s retreated. We have to do that here,” urged Alikpala, who previously chaired the Metropolitan Waterworks Sewerage System. Alikpala also urged the audience to pay attention not only to water supply, but also to water demand. “What are we doing about decreasing demand?” he asked. He cited household-level strategies to optimize water use, such as water loss reduction, pressure management, water reuse, drainage management, and rainwater harvesting. Alikpala also recommended, on a larger scale, putting in place system metering, water efficient fixtures, and pricing policies. 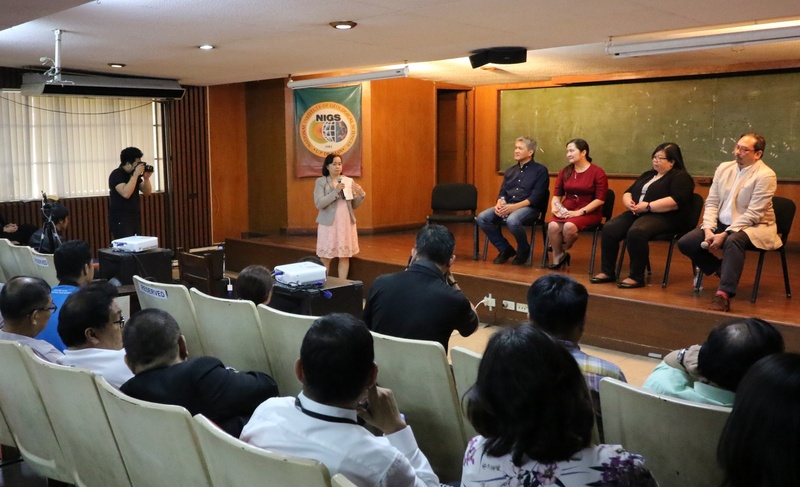 The forum also looked at the climate forecast in the next few months through the lecture of Ruby Abastillas, senior weather specialist at the Philippine Atmospheric, Geophysical and Astronomical Services Administration (PAGASA). Abastillas explained how the El Niño-Southern Oscillation has been affecting weather patterns in the Pacific region, including rainfall and drought in the country. PAGASA’s numerical weather forecast was also emphasized in the talk of Dr. Sanchez as she explained how it could be used in the Dam Operation Optimization System, a decision-making tool that could be used in mitigating the effects of floods and maximizing the storage capacity of dams during extreme weather events. At the open forum, the speakers and participants discussed the need to set-up a separate Department of Water and an independent regulatory body for water, among others. Present during the event were Dr. Carla Dimalanta, UP assistant vice president for academic affairs (research) and president of the Geological Society of the Philippines (GSP), who officially opened the forum, and Dr. Decibel Faustino-Eslava, dean of the UPLB School of Environmental Science and Management (SESAM), who synthesized the lectures.